It’s a rainy fall day here, and honestly, I love a nice bowl of soup when the days get shorter and colder. This Pumpkin Sausage Cheese Soup filled my belly with love. Pumpkin makes great deserts but also makes a nice creamy soup. If you’ve never had a savory pumpkin dish, I suggest you try one now. Surprisingly, pumpkin is a very mild squash unlike butternut or acorn . It’s no wonder it makes a good pie. My kids and husband cannot tell when I add pumpkin to homemade mac and cheese. It adds a vegetable to the meal, (Mom win!) along with smoothness to the pasta. It’s such a nice complement, I promise. I like to visit the pumpkin patch in the fall and buy heirloom pumpkins to make purée out of. The long island cheese pumpkins have a smoother, creamery taste than a sugar pie pumpkin. They seriously live up to their name. You can tell this one by the light, pasty orange color. There are all kinds of heirloom pumpkins with a better flavor than the sugar pie ones. They started using the sugar pies ones because of the ease to mass produce. They all have a nice flavor, each one a bit different, but I would definitely recommend the long island cheese one. It’s my personal favorite for both sweet and savory. To make your own purée you cut your pumpkin in half or quarters, scoop out the seeds, remove the stem, and bake for 350 degrees for 45 minutes, shell side up. Once fork tender. Scoop out the shell, and purée in a blender. I usually freeze mine in the same way you would buy your cans of pumpkin, 15 oz (2 cups), or 29 oz (3 1/2 cups), in labeled ziplock freezer bags. There is a good tutorial here, not sure which one I used in the past but this one sounds about right. You could always just bake one at a time for the recipe you are making as well. I prefer my pumpkin purée over store-bought cans. Once I tried the difference between fresh/frozen heirloom pumpkin purée I will not go back to the cans ever. It makes a huge impact in the quality of your dish. To make the soup, I started by cooking my sausage, onion and garlic with tablespoon of olive oil until cooked through. Once browned, I melted 1/4 cup (half stick) butter and 1/4 cup flour and cooked for a couple of minutes to combine. After my roux (equal parts fat and flour) has heated a couple of minutes, I added one cup milk. stirred until combined, then added 1 cup chicken stock, and 15 ounces (2 cups) pumpkin. Once your soup comes back to a simmer, add your cheese: Farmers, Havarti and Cheddar, stirring continuously until cheese melted throughout. Spinach or kale would make great compliment as well to this soup as well. I garnished my soup with Asiago cheese and fresh thyme. I also made some fresh rolls to dip into this creamy soup. This soup is sure the warm your soul on a cold day, or after a day of duck hunting. Even my husband, who was unsure about pumpkin soup, loved it. cook sausage, onion and garlic with tablespoon of olive oil in a soup pot until cooked through. 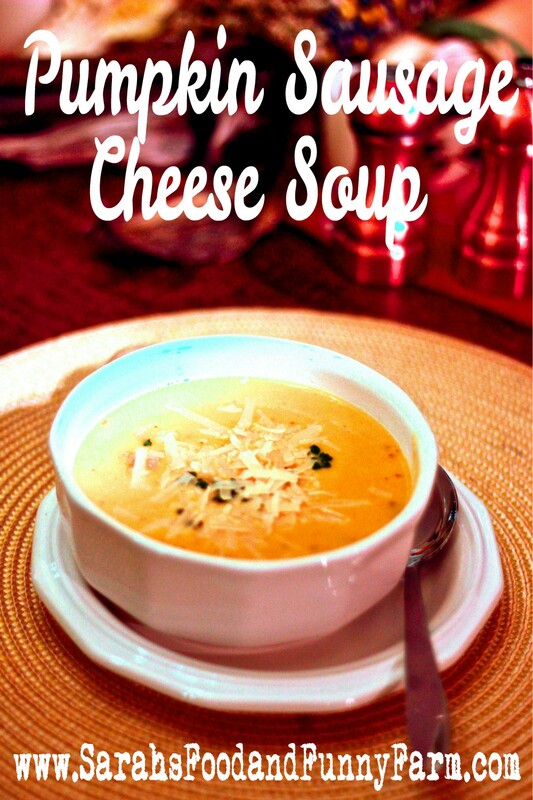 Once your soup comes back to a simmer, add your cheese: farmers, havarti and cheddar, stirring continuously until cheese melted throughout. Hope this fills your belly with love! good information & nice post . & thanks you for sharing post . I’ve never considered adding pumpkins to Mac & cheese lol, I love that idea! I can’t wait to try this, it looks amazing! Thank you for sharing this wonderful recipe! Sounds delicious! And I love the idea of putting pumpkin in Mac and cheese. I will definitely be trying that, and your soup! Beautiful pictures!! And this looks so delicious! I love soup during fall/winter and this one sounds different! The ingredients sound good though, so I definitely need to try it haha. 🙂 Thanks for sharing! We only have pickled pumpkin here in Estonia as pre-made food. And it is quite sweet. I have been thinking of making soup out of real pumpkin forever. I think this was final push. Also they look so nice and colourful. Pickled pumpkin, If i ever find that here I will def try. It is so good in soup esp fresh. Looks tasty. I’ll have to give this recipe a try. Soups are always perfect for this time of year when it gets colder.